The Australian chef David Thomson deserves a lot of cred and respect for what he has done to put light on traditional Thai food. 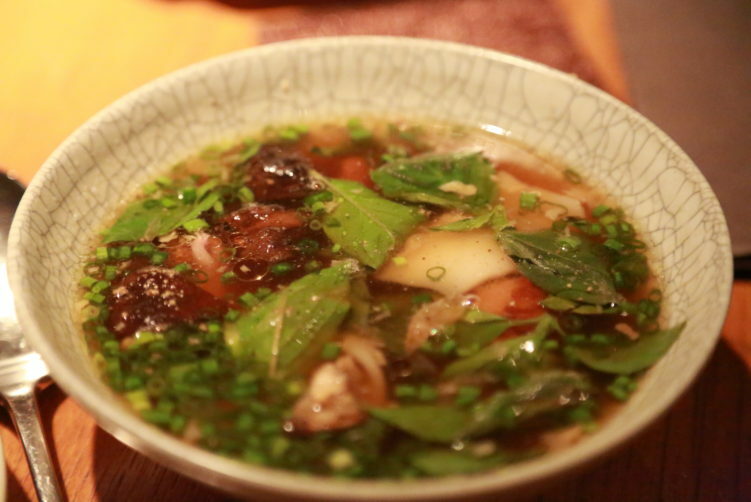 His Nahm restaurant in Bangkok serves plates and bowls from different regions of Thailand. 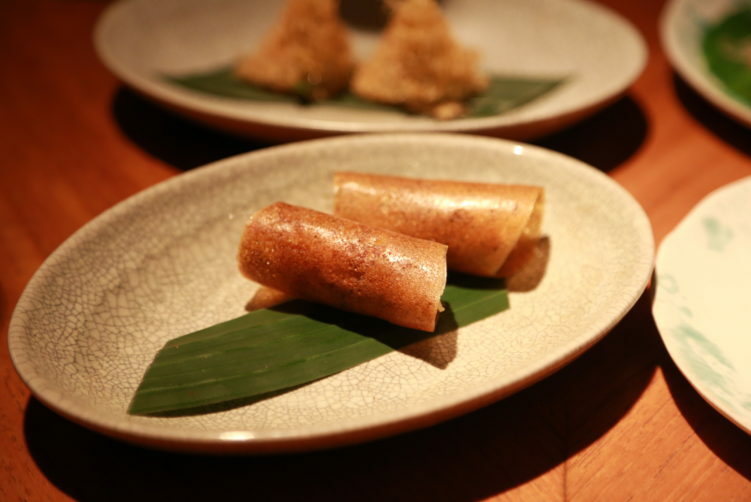 The food at Nahm Bangkok is good, but overall not exceptional and the price tag is a steep one. David Thomson received a Michelin star for his Nahm restaurant in London in 2002, lost it in 2011 and closed it in 2012. 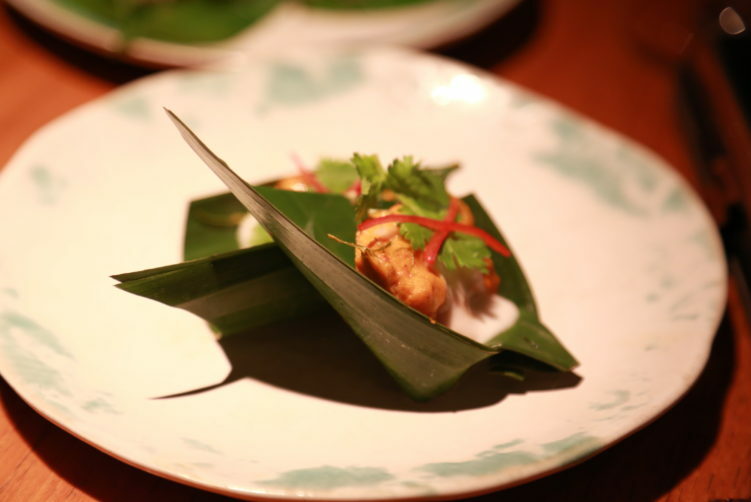 He opened Nahm in Bangkok in 2010, situated in the Metropolitan Hotel in Sathorn in Bangkok. He has written several books on Thai food, including “Thai street food” with recipes and an underlying story of capturing the atmosphere of today’s Thailand. I went to Nahm with Nina and Nina, two friends of a friend of mine. We ordered the set menu based on the à la carte menu in order to offer a wide a range of dishes. It included an amuse bouche, four appetizers in addition to a family style dinner set, supposed to be shared by all, and a personal choice from the dessert menu. One of the Nina’s are allergic to shellfish, but they were accommodating to make sure that she was served the same type of food. With a couple of exceptions all of us ate the same dishes. Also, she got one dish on her own (chicken curry). 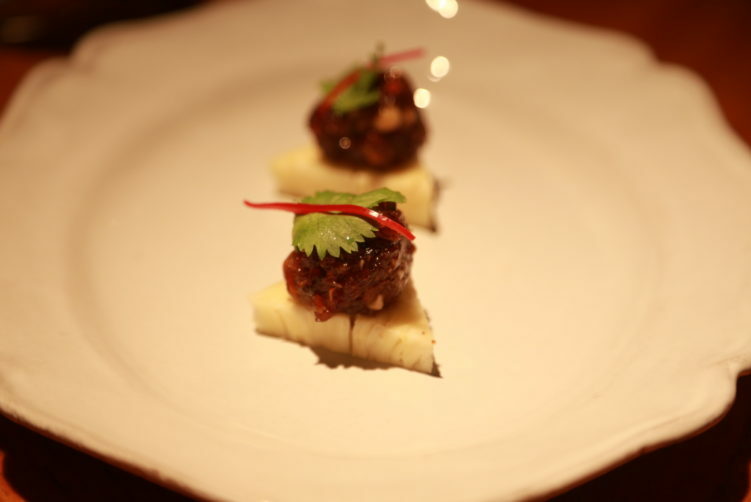 Our first bite of the meal, the amuse bouche, was minced chicken and other minced proteins mixed with peanut and some pinches from the chefs spice bowl, served on a pineapple wedge. It was a good mouthful that gave some expectations for the meal. 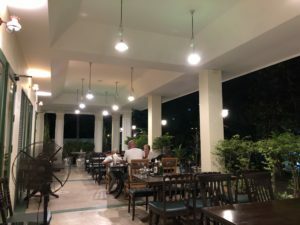 We then got four appetizers; egg nets with prawns, wild almonds and kaffir lime, pork and lobster with shredded ginger and Thai citron, crab wafers with coconut, galangal and coriander, and steamed red curry of scallops with Thai basil and coconut. 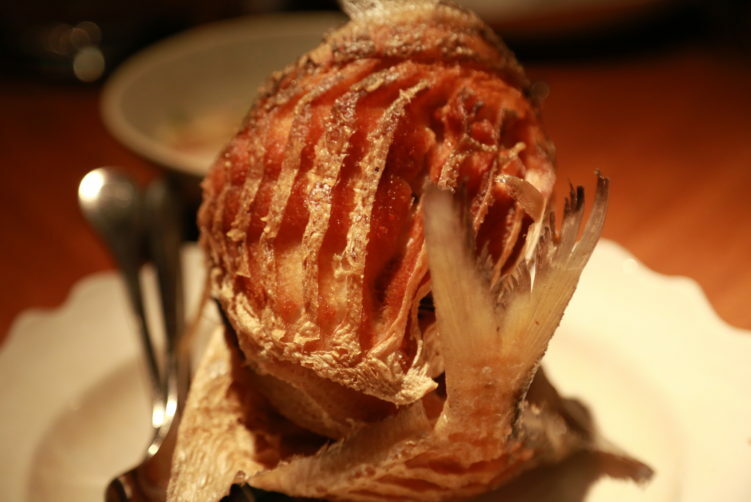 The appetizers are rich in flavours, as is the amuse bouche, without being exceptional. The pork and lobster with shredded ginger and Thai citron was a bit unbalanced with the citron stealing most of my taste buds. Even in Thailand lobsters have to be handled with care when seasoning it. Don’t get me wrong, it was good, but could easily have been better. The wafers was straight forward with little complexity. 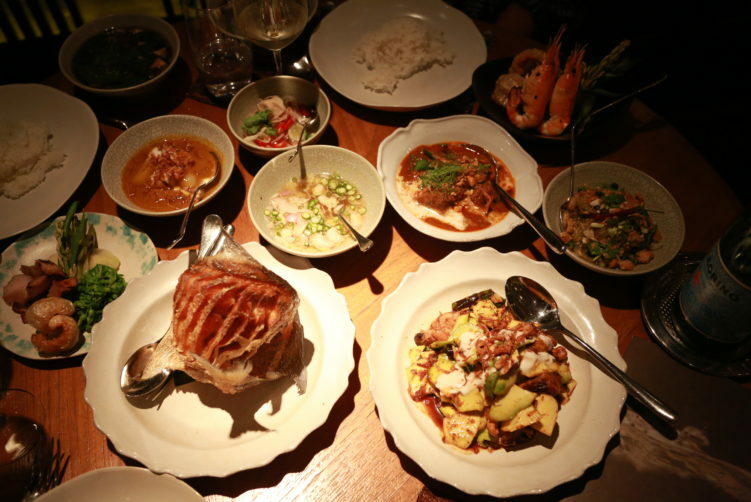 The main plates at Nahm Bangkok, served family style, gave a good mix of different methods with food that represented different regions of Thailand. I have to say I’m a bit sorry for the Nina with an allergy as the best dish was the one she couldn’t eat – Penang curry of Wagyu beef with peanuts, shallots and Thai basil. It was a rich curry with beef that melted in your mouth, complemented by fresh aromatic kaffir lime. Chef Thomson have used a basket of spices to get here, creating a delicious harmony. The clear soup of roasted duck with Thai basil and young coconut was a good bowl, but a tad to sweat for my tongue. The whole fried fish with lemongrass fish sauce and a relish was good as well, and both the Nina’s expressed it as one of the best dishes. Green mango salad with grilled pork neck and sour leaves was also a welcoming mixture of tastes. Nam prik num, a chili relish from Chiang Mai came together with river prawns, pork crackling and some cool steamed local herbs/vegetables, including cabbage, beans, pak waan (a leafy vegetable) and the plant of galangal (not the root). The river prawns were dry and far not exciting. The chili relish was good, but less spicy than when served up north, which probably is a wise idea. The herbs/vegetables was good and a nice experience, with the plant of galangal being the spicy one with an intense flavour. The main plates, served family style. (Sorry for bad picture quality. It certainly looked a lot better on the table). The special dish for Nina that had an allergy was the aromatic curry of chicken with pickled cucumbers. It came with a bowl of cucumber and chili pickles. Well balanced, but nothing mind-blowing. The service at Nahm Bangkok was good and attentive. One of the waiter’s was very helpful in answering our many questions about the food and the ingredients. The atmosphere is smart casual and the localities are nice with round tables, allowing one an not several conversations. Nahm is in no way a must visit, especially when taking into consideration the prices. That said, it’s an interesting meal with good food spanning Thailand from south to north. That said, I know tons of street food vendors offering a more tasty experience, but again that’s a different concept from a to z. You don’t go wrong by visiting Nahm, but the prices are really not justified – B 13645 for three different set menus, a bottle of San Pellegrino and a decent Riesling (B 3300). That’s enough money to eat all your meals out for 2 months in Bangkok without compromising on the quality. How to get there: Lumphini is the closest MRT station. Taxi is most likely the best option to make sure you don’t arrive to sticky. Nahm restaurant in Bangkok serves plates and bowls from different regions of Thailand. The food is good, but overall not exceptional and the price tag is a steep one. See full review at StreetsideBangkok.